The PSNI have said "nothing untoward" has been found during a security alert close to a police station in Londonderry. The alert began at about 21:00 BST on Monday. The Strand Road, Asylum Road and Lawrence Hill were cordoned off while the police carried out searches of the area. 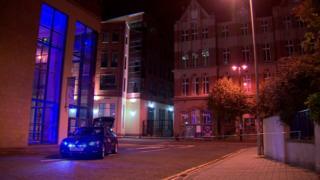 Derry mayor John Boyle said more than 100 people had been trapped in a bingo hall opposite the police station. Those people were later allowed to go home. PSNI Ch Insp Alan Hutton said police had been acting "as a result of information received". "Following checks of the area, however, nothing untoward was found. "I want to take this opportunity to thank the public for their patience and co-operation while the area was checked, especially those who were inconvenienced," he said. The roads reopened about 01:00 BST on Tuesday.